Film Networking Mixer from 5:30 to 6:30 PM in Pickford lobby. Showcase at 7:00 PM. 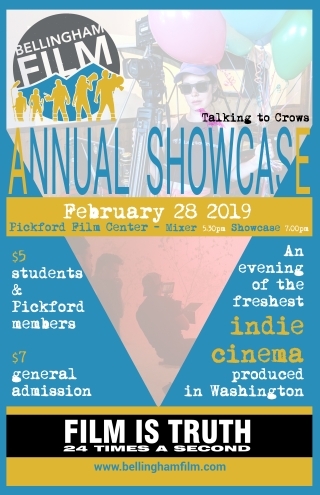 Bellingham Film, in collaboration with Film Is Truth and Talking To Crows, presents the Bellingham Film Annual Showcase and Mixer! The Showcase is a curated selection of content in a variety of film genres -- short narrative, documentary, and music videos, to name a few -- all produced in the state of Washington. The Bellingham Film Annual Showcase specifically looks for content that demonstrates exceptional quality in writing and directing, curating a night of fresh cinema from emerging filmmakers in our state. Bellingham Film hosts mixers every other month to strengthen our film community. This month's mixer will precede the showcase creating a unique experience for the audience and filmmakers to network, collaborate, ask questions, and raise awareness of the work that's produced in the northwest. We'll see you at the movies!